I am still dealing with a sick bike, Scarlet is still down with her bike ailment with no end in sight. 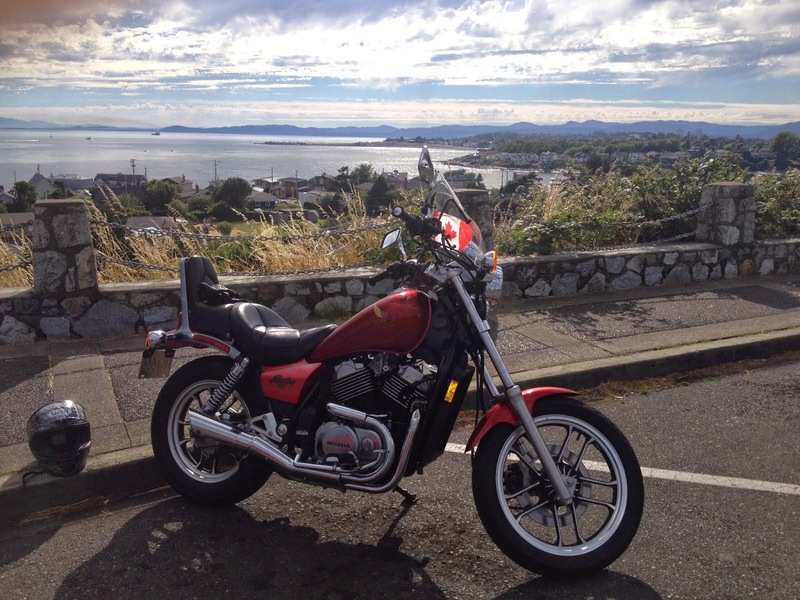 I have been riding Motorcycle Man's 1983 V45 Magna 750, UNTIL tonight. I rode to a meeting I had, all was okay until I got home. I was going to put Monster away & tuck her in for the night and that is where things fell apart. I was going to put the bike in neutral & park. I pulled the clutch in all the way and was gently toeing up when there was a loud 'snap' sound and the shifter went floppy. NOT GOOD. Oh my goodness I just about had a heart attack on the spot & threw up, I hurt Monster. But the worst is yet to come. So who rounds the corner but Motorcycle Man, all I can say is UGGGGHHHH!!! How do you tell a guy who has been good naturedly letting you go freewheeling on his bike that there is now a problem. I told him what happened and let's just say he is NOT a happy camper right now. I am officially dubbed the 'Bike killer'. (Let's just forget that the bike is 30 years old) He rolled Monster to the fixing spot under the deck and started taking it apart, the shifter linkage snapped off and needs to be welded or a new/old/used one found. I have already looked on eBay and located some. I am going to phone the motorcycle salvage place tomorrow & see if they have the linkage assembly/shifter/footpeg. Tomorrow getting to & from work is complicated by the fact I have no transportation to get to/from work. I am going to have to cancel the insurance on Scarlet because I have no idea when or if she is going to be fixed. My scoot is not insured and that in itself is complicated because I can't insure it because Motorcycle Man is on the title & he has to do it. I am feeling exasperated, frustrated and completely overwhelmed by my 2 wheel transportation issues. I don't know if the moto universe is sending me a message that the riding thing needs to stop or it's just bad bike juju, I just dunno. Come join VISC instructors and alumni and learn everything you wanted to know about getting a motorcycle license! Click here for the link to Vancouver Island Safety Council Open house June 16, 2012 10:00am to 4:00pm. Everyone is welcome! Most of you have seen my previous post regarding the rally. The Capital City Scooter Rally is very diverse and spans the generations of scooters and even the occasional 'shifter' as I was referred to on Saturday night due to riding a cruiser motorcycle. There was everything from beautifully restored vintage Vespas and Lambrettas to more 'earthy' needing lots of TLC kind of scooters to modern day Vespa, Piaggio, Yamaha, Honda, and Kymco to name a few. I am an equal opportunity rider, I love them all and could care less whether it was a motorcycle or scooter, as long as it has two wheels I am in love. My roots in two wheeling came from riding pillion for 29 years, but my own two wheeling history started with the little 50cc Yammy Scooter which I rode in my first rally last year. My adventure has changed so much in a year and I have grown by leaps and bounds. Last year I was trying to get lost in the pack and keep up and not being a poser. This year I had the pleasure and honor of leading two group rides. On the evening ride when I looked in my mirrors it was a breathtaking site to see 14 maxi scoots behind me and my dear friend Bob was riding sweep. It was a blast! I think scootering will always be in my blood and after riding with the Vancouver Scootering Crew on their maxi scoots, I am pondering my two wheel future and wondering if there is room for a larger cc scoot or even a vintage Vespa. Hmmm. 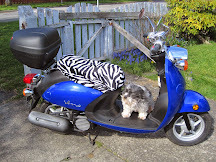 While I ponder this have a look at some of the vintage scoots and other lovely little scoots I came across. PS: I also earned the nickname 'Grand Mistress Dar' - lol - that makes me smile. I wonder if the driver ever gets sea sick looking in all those mirrors? You definitely have every angle covered thats for sure. They are all beautiful whether they are rusty or perfectly restored. Can't you just see the potential lurking under the surface? Dinner meet-up at Ross Bay Pub, but my scooter crew wanted Chinese food. I am so glad I went with them, dinner was delicious! I love this particular scooter with the fighter jet on the front fender. I was admiring it last year and was happy to see it again. Loving this scoot's license plate mount. This little Ruckus picture is for my friend Deb of Ruckus Scooter Love. I saw this and had a chuckle and thought she would appreciate the picture. Love the horns! It was an excellent weekend and so much fun. I think I am going to be saving up for a bigger cc scoot or even a vintage one. There is something romantic about scootering and just a little quirky. Until you've ridden one you don't truly understand the mystique and cache of everything scooter. So go on, I know you want to try one, but beware once you do, you'll be hooked! Today was an awesome day! I was out all day with scooter peeps. Motorcycle Man kindly let me ride Monster for the day and I met up with Bob and his troop of Vancouver Scooter Club friends. It was awesome. They were riding beautiful maxi scoots and I have to say I would seriously consider buying one of these in the future when I want to change it up. 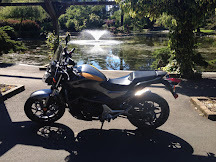 We rode out West Saanich road and chased some twisties, then out to the West Shore and rode down to Esquimalt Lagoon. After our ride the fellas were feeling a wee bit peckish so we stopped at A&W for burgers and rootbeer. I had a great time with Bob and the boys. At one point one of them called me the "Mistress Goddess" gotta love that! We had a lovely chinese food dinner and then went on another more leisurely evening ride and finished it off at Tim Horton's. Its all about food! Ride to eat! When it came time to say goodbye and call it a night, we were all sad and wanted the day to continue. Sun, friends, 2 wheels and twisties - who could ask for anything more?! Me and the boys at Esquimalt Lagoon. Evening ride along Beach Drive. Tonight as I was leading the group and looking in mirrors it was a pretty awesome sight seeing 14 scooter headlights following behind you. The group rode beautifully and it was a pleasure sharing the road with them! Blog Challenge "Whats that Wocket in Your Pocket"
These the are all the little goodies in my pocket: camera, first aid kit, lipstick, baggie for cellphone, change, license, bank card and ICE card and gum. It all depends on the season we are in because sometimes there can be more goodies in there. I LOVE MULTITUDES OF POCKETS! 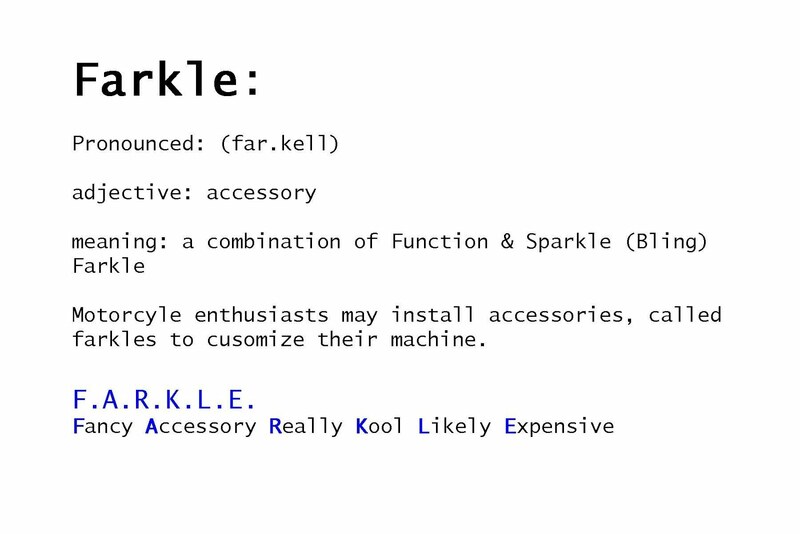 So "Whats that Wocket in Your Pocket?" Happy Mother's Day! Summer has arrived on Vancouver Island! Today it was 23C, sunny, hot, GORGEOUS!!!! My day started with coffee delivered to me by Scooterpie Jr, followed by a fabulous frittata and toast with nutella and thinly sliced bananas. Breakfast was yummy! Scooterpie Jr and Motorcycle Man gave me a beautiful pendant a key with a ruby centre stone. They gave me the key to their hearts. I love my family! Day was paced pretty leisurely and I didn't have to worry about dinner either. The afternoon was one that beckoned you to be on the bike and I heard the siren song of twisties calling to me. I was able to sneak out with 3 other girlfriends and we went seeking twisties. It was fabulous! The scenery was spectacular and it was breathtaking. Hope you all had a wonder Mother's Day or just a plain beautiful sunny day! So now we are in limbo and I have a bike that isn't running. Any ideas? On Friday, May 4th, a diverse group of 30 female riders met for a day of fun and riding. The morning weather was not promising, with rain and wind being the flavor of the moment. All I could think was. "Mother Nature can't you give the sista's a break?!" The Victoria IFRD team of Alison Smith, Debra Roberts, Bobbi Bjornholt, Chantele McPhee and myself worked very hard putting the event together. We were so fortunate to have swag donated by several local businesses that support female riding. The purpose of IFRD is to promote motorcycling for women and to let the wider world know that we are out there on two wheels on everything from sport bikes - cruisers to scooters. Founder Vicki Grey of Toronto, Ontario, started the ride event in 2007, each year the ride grows. This is the biggest IFRD day to date with riders from countries across the globe from places as far away as India, Kuwait, Italy, US, Canada, and Europe. The event empowers women and encourages them to be a part of the motorcycling sisterhood. Vicki has been involved in motorcycling as a sport as a racer and as a professional motorcycle instructor and coach. 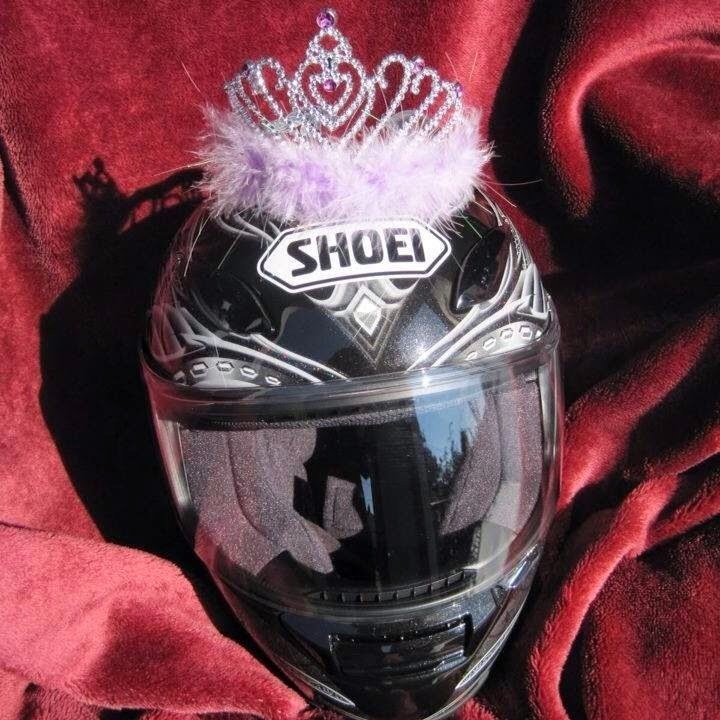 She has inspired many a female rider and contributes to the motorcycle world with her blog Motoress. Riders from across the motorcycle spectrum, sport bikes, adventure touring, cafe racer and cruisers met up for our Rock The Island event and WE DID JUST THAT! Two local media outlets covered the event and we got out our message of safe motorcycling and our call to car driver's to drop their handheld devices, practice safe driving skills and remember to shoulder check before changing lanes and to be cognizant that there are other road users. 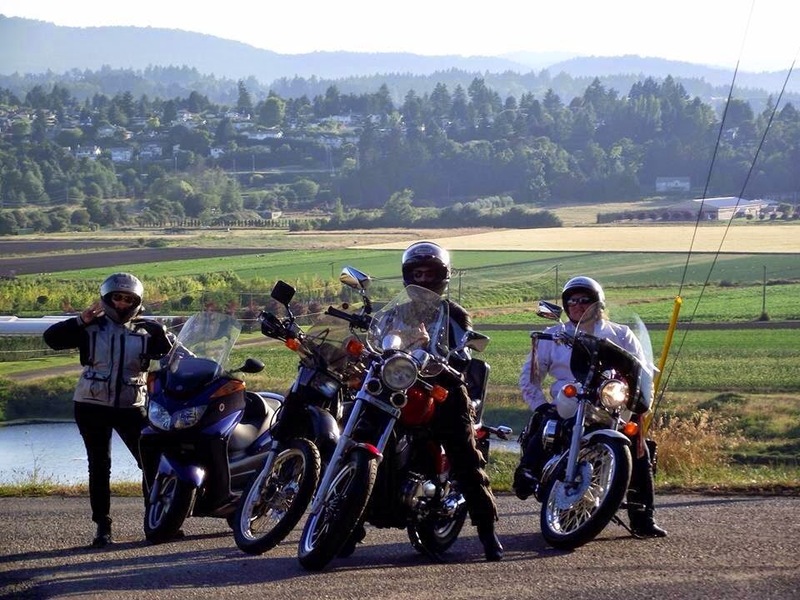 Two separate routes covering Vancouver Island were done, with riders going out to Sooke and Jordan River and the other run down the beautiful Saanich Peninsula. Mother Nature finally decided she was going to cut us a break and let the sun shine through and a happier group of women could not be found anywhere on the island. We met up at Savage Cycles to gather for some fabulous swag draws and talk about our adventures. It was an amazing day. I can hardly wait until next year! Group Two out in beautiful Sidney by the Sea - notice our beautiful parking job! Finally back at Savage for Swag draws - tired and happy! Myself and two other Moto Mama's on a lovely evening run through downtown Victoria in front of the Fairmont Empress. Our Moto Mama friend Cindy couldn't make it out during the day, so we held our own IFRD event. We tootled downtown Victoria and completed the scenic Dallas-Beach road loop. I was on my bike for 12 hours by the time I pulled up back at home, exhausted, happy and contented. Beautiful horse drawn carriage riding by our steel ponies. I can hardly wait until next year!!! !